Structural racism, discrimination, and unconscious bias drive an overrepresentation of Blacks experiencing homelessness, according to a new report by the Los Angeles Homeless Services Authority. “Report and Recommendations of the Ad Hoc Committee on Black People Experiencing Homeless­ness” was formed at the direction of the LAHSA Commission. “We all know that the local data shows that in Los Angeles County, 1 out of every 10 residents are African American, and yet, 1 out of every 3 homeless persons are African American,” said Ridley-Thomas. According to the report, it is an over-representation consistent demographically across the United States. “The stark disparities that are the product of vicious and entrenched structural discrimination in all of its forms in our society: the justice system, our schools, our safety net, our workplaces and our halls of power,” he said. 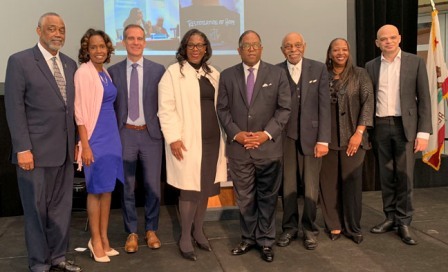 He spoke to more than 100 L.A. County leaders homeless advocates, and activists who gathered for launch of the report at the California African American Museum on February 25. Researchers found that discrimination in housing, employment, criminal justice, and child welfare policies have led to disproportionate numbers in Black homelessness. Lasting change requires a dismantling of institutions barriers across agencies and mainstream systems, they found. The document cites 2017 Homeless Count estimates, which indicate that over 53 percent of Blacks experiencing homelessness were between the ages of 25 and 54. Individuals age 55 and older comprised 26 percent of the total population. In addition, it went on, the plight of homelessness is made more complex and challenging by its link to incarceration. Embedding care and empathy in outreach and case management services, as well as policy and program design will effect change, according to researchers. 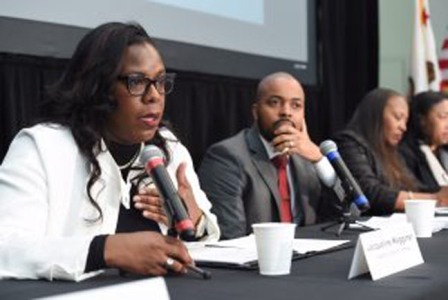 “While we make up only nine percent of the population, we make up nearly 40 percent of the homeless population, so giving some focus to what solutions could be to help people exit homelessness was paramount to this work,” said Jacqueline Waggoner, LAHSA Commissioner and chair of its 26-member Ad Hoc Committee on Black People Experiencing Homelessness. She, along with Kelli Bernard, Chair, LAHSA Commission, and Peter Lynn, LAHSA Executive Director, extended sincere thanks to partners and community members, particularly individuals with lived experience of homelessness, for contributing to the study. Sixty-seven recommendations out of the nine-month study include improving data collection, analysis and collaborative research to better understand and track issues affecting Blacks experiencing homelessness; and, advance racial equitable policies, programs, and funding across institutions. After invocation by civil rights leader Reverend Cecil “Chip” Murray, L.A. Mayor Eric Garcetti, L.A. City Council Members Curren Price and Marqueece Harris-Dawson, Reba Stevens, an Ad Hoc Committee member and advocate who has experienced homelessness, and Glenn Harris, president, Race Forward, which advocates for racial justice, also gave opening remarks. Following the launch and a brief press availability, advocates and stakeholders held a symposium to highlight the data and next steps. Price called the day exciting because of the call for action with documented proof of what’s needed to eradicate homelessness. He shared a personal testimony of how homelessness had touched his own family and many others in the same way. Harris-Dawson, explained that the new study is follow up to a 2016 report on homelessness in South L.A., compiled by his office. He urged leaders and advocates to follow up to the data gathered in the new study with a scientific approach. He used his time to sound a sobering note, saying it’s not the first time people have seen such a study or passed recommendations. “We’ll go all the way, all the way, all the way back to the end of the Civil War. There as a recommendation about 40 acres and a mule, and we didn’t quite get that done,” said Harris-Dawson. He noted other landmark reports, bills and recommendations through the Civil Rights era to the early 90s that produced little change. 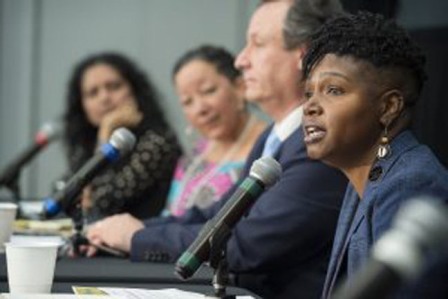 “…We should be here and rightfully celebrate this report and celebrate the work that is done and all that we’ve accomplished, but we must all hold our fee to the fire and this time, we get it done, and we get it done in the right way,” said Harris-Dawson.